Placing crown molding in the area where the walls and ceiling meet can add depth to any room. Today’s molding can be made from many different materials. Here’s some information on the various types available. For homes with curved window bays, doorways or walls, flex molding may be the best choice. It can resist breakage and splitting and can curve and bend around various shapes. Though it may not be as expensive to install, it can be expensive to purchase. Wood molding may be one of the most popular and traditional types utilized in homes, but it can be among the most expensive forms of crown molding. It can come in a variety of grains, may not have to be painted and can be sculpted into almost any pattern to add uniqueness to a home’s décor. Wood molding, however, can split during the cutting process and may swell, shrink or rot in different weather environments. Also referred to as medium density fiberboard, MDF is made from synthetic resins and sawdust. It can be very lightweight and may not warp or split, but it may dent or nick easily. MDF may need to be stained or painted but can be cut easily with a miter saw, and may be a cheaper alternative to wood. PVC molding can be used in rooms, such as bathrooms, where moisture may be present. It can have a slick surface that may require painting, which may be difficult, but it can also be water resistant. Polyurethane can be very versatile. It may be less expensive to purchase than other moldings and resistant to rot and insects, but it can dent and nick easily. 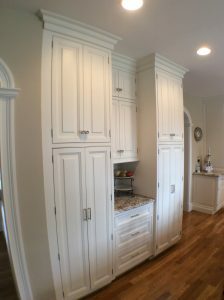 Like other manufactured moldings, polyurethane may need to be painted. Polystyrene crown molding may be among the least expensive and easiest to cut and install. It can be cut with scissors or a knife and can be installed with construction adhesive.